Você deseja ver o mundo, não guias turísticos, piscinas de hotéis e cadeiras, então você está certo aqui! Nossas acomodações em Thong Nai Pan Noi, em Koh Phangan, Tailândia, estão tranquilamente localizadas, com excelentes vistas para o mar. Em 10 minutos você está a pé na praia (talvez a mais bela em Ko Phangan), onde você vai encontrar tudo que você precisa ou precisa de férias, restaurantes, lojas, bares e, claro, a bela praia não superlotada. Localizado em um grande jardim tropical com piscina e tem uma sala de estar, quarto e sala para crianças e cozinha, banheiro e um grande terraço totalmente coberto com vista para o mar. A cozinha está equipada com geladeira, fogão a gás, microondas e dispensador de água para beber água. O banheiro é equipado com chuveiro de água quente e banheiro ocidental. Todos os quartos têm ventiladores de teto e ar condicionado nos quartos. Nous avons adoré notre séjour de deux semaines dans la jolie maison en bois de Walter et Jin. 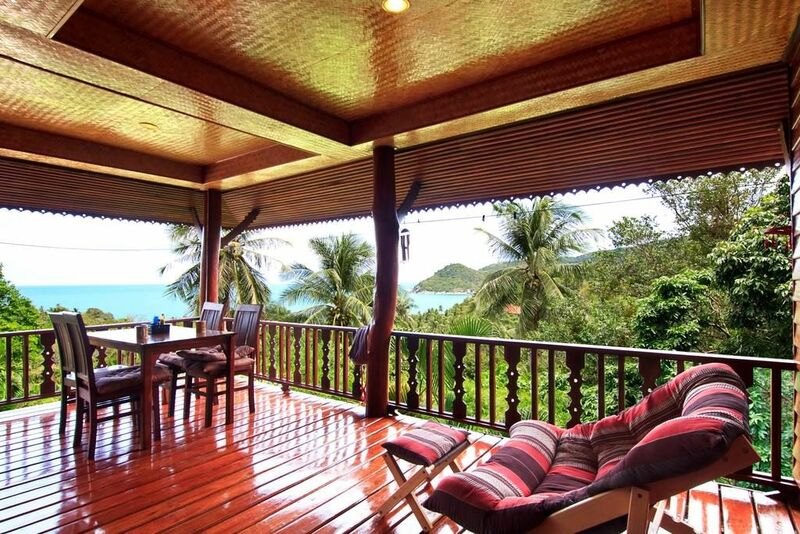 La maison se trouve dans le domaine de "hills village" et surplombe une magnifique baie dans le nord est de Koh Phangan. La maison est spacieuse avec ses deux chambres, sa cuisine et son salon... Mais le must, c'est la grande terrasse et sa vue sublime sur la baie. Une belle piscine à débordement complète cet ensemble où régnent paix et sérénité. Mrs Eed, qui régit le domaine avec son mari est adorable... Elle est venue nous chercher au port et nous a ramenés... S'est occupée de la location d'un scooter et prépare les repas à la demande, pour un prix modique. A quelques centaines de mètres, se trouve un petit village plein de charme avec restaurants, quelques petites échoppes et des salons de massages. Il faut cependant être motorisé car l'endroit est isolé et assez pentu. Nous reviendrons l'année prochaine. We had a wonderful time at this house. It was great for our family of 3 children with the pool right there and good deck space for playing. Amazing sunrise views and fully functioning house. Whatever we needed or was missing from the house, Eed, the manager on site, was so great about providing what we needed. Was wonderful to have the restaurant on site for when we didn't want to cook (which was often, we were on vacation after all!) Beach was too far to walk and required renting a car, but we did have the small children and was easy to organize with Eed. If you are looking to stay here and cook, you would need to go to Thong Sala for supplies, as the town nearby is only good for a few basics and some fruit stands. But there are plenty of wonderful options to eat out in town, which was great!. A beautiful and peaceful oasis with an exceptional view. My husband and I recently spent some time here with our 20-month-old and we had a wonderful stay. We were practically speechless each morning when we walked on our terrace to admire the stunning view from our house. It felt as if we were just floating amidst lush jungle overlooking the sea. Our house was also really comfortable and clean--we wished we could have stayed longer! (It was also a plus that our Internet was super fast with no issues.) The pool was also great and had a fantastic view as well. The food from the restaurant there was very nice, and the place is very child-friendly. Eed, manager of the Hill Village, was great. She was very helpful in showing us around the area and helping to fulfill any request we had, including finding medical help when our baby needed to see a doctor. The rest of the staff were also super kind and responsive as well. Everything was super easy and stress-free at this place. It's also about a 15 minute walk to town and the beach, so it's very well located. We really hope to come back. Thank you for your great review. We are very pleased that you liked it. Formidable séjour de 5 nuits dans ce gîte. Superbe emplacement, vue magnifique ! Location très propre et bien équipée. Très bon accueil et service de transfert très appréciable. Nous garderons de fabuleux souvenirs de ce séjour en famille. Merci. We stayed at Walter & Jin's house with my friend and our two small kids for 10 days and we wish we could have stayed longer. It was the perfect place to relax and enjoy nature. The house is spacious, charming and clean. And the view from the terrace is absolutely beautiful. The beach is a dream and only a 10 minute walk down the hill. Mrs. Eed and her family are very friendly and helpful. Her husband also cooks the best fresh meals if you want to eat in. We can only recommend and hope to be back soon! Had a fantastic Holiday, The Accommodation was excellent we stayed in the family house as we are a family of 5, plenty of room, I would say room for 2 more.the balcony had a great view over the pool and bay. The village is small and lovely with some beautifully landscaped gardens an infinity pool which overlooks the bay. Eed's husband is a great cook and the breakfasts and meals were of great quality, give plenty of time ordering as everything is done fresh and by themselves. The beach is one of the most beautiful beaches ever with soft white sands and warm turquoise waters, Can be a hot 10 minute walk back to the village but Eed can sort a car or moped out for you at a reasonable price. We really enjoyed our stay here Than Sadet beach and its waterfall are just around the corner, great food also in town and at the beach. Adrian Shazma and the boys.